It’s easier to see in this view how the aloe’s amazing root system attaches itself to the thick trunk. 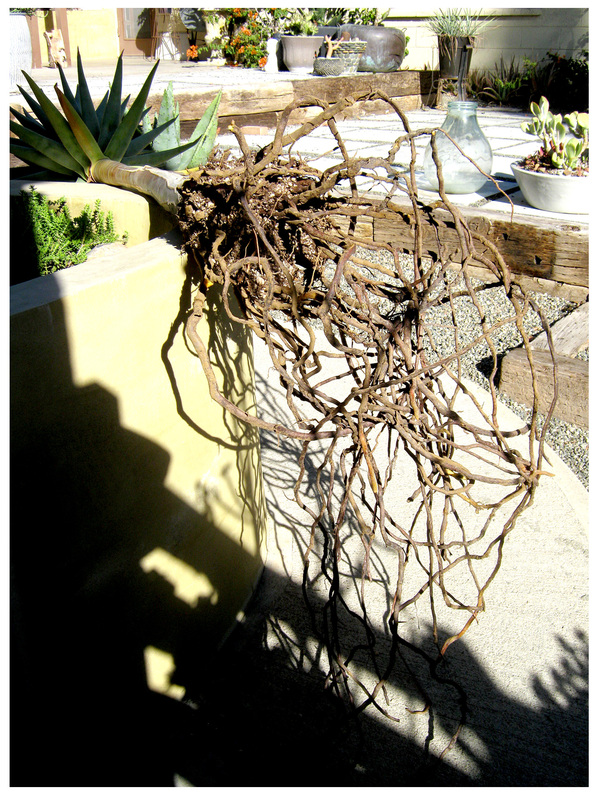 Studying them, I can’t help but be reminded of the paintings of Brice Marden, with their gnarled inter-connected tracery (click here for example). 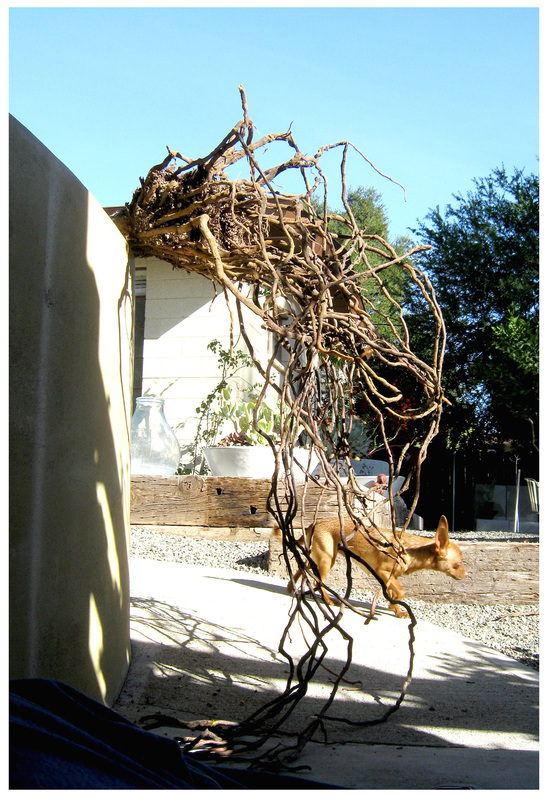 Similarly, I’m reminded of Alison Saar’s sculpture, ‘Conjure’, featured in this recent post (click here). 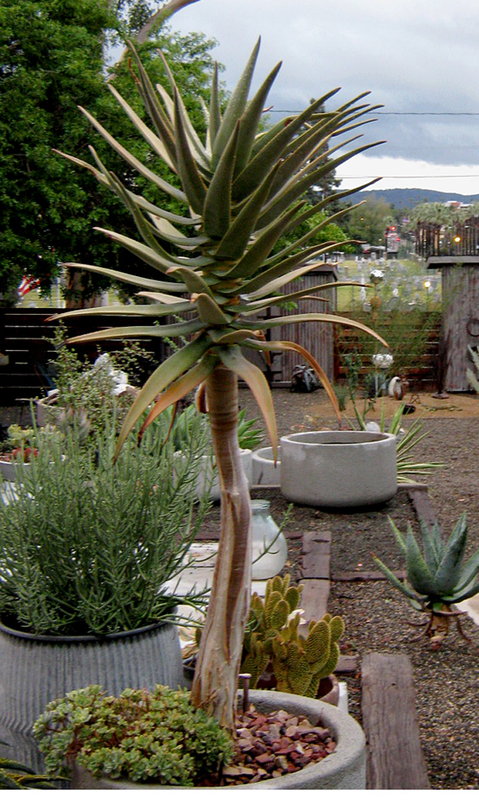 The aloe’s new home was recently occupied by a sizable yucca that broke when its branches became too top-heavy. 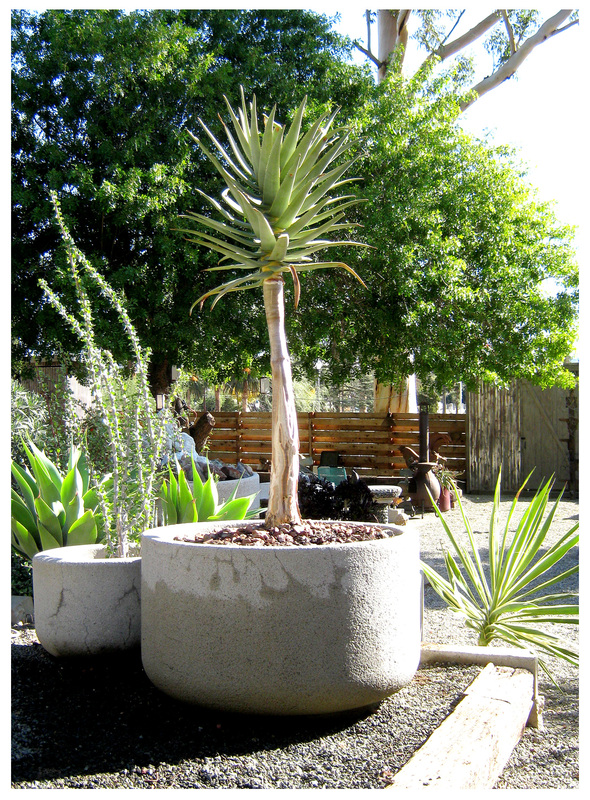 After removing the yucca, I’d wondered what I’d put in this huge concrete pot next … serendipitously, the aloe tree makes a perfect new resident. In the inset picture you can see the smaller pot, with the vacant larger pot in the background. More than twice as wide, and deep, as its former home, the aloe should enjoy having the additional room to roam in this pot. Should the aloe double in size, again, I’m thinking I’ll have to plant it directly into the ground. That is, after rounding up a crew of helpers. If the effort Paul and I expended in this transplant is any indication, we’ll surely need assistance at that point … this move has left me with a serious backache. Heh! Missed opportunity. When I saw that gnarl of roots my first thought was, ooh!, hang some fairy lights on it! (Yes, I can feel you cringe) Then I smacked myself back to sanity. It looks lovely in it’s new pot. Jealous of your warm sun…and I love the aloe tree in its new container. Where ever did you find such simple good looking (and sizable) pots? Where all good things come from: craigslist. They were all salvaged from a hotel demolition in Long Beach, and the guy who sold them to us not only gave us a deal ($600 for all) but delivered them, too, for no extra charge … all the way from Hesperia, about an hour away!